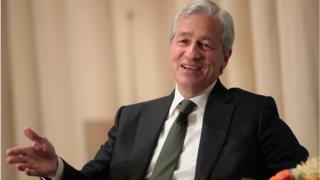 Although JP Morgan's chief executive Jamie Dimon has publicly criticised Bitcoin - the first crypto-currency in existence - on several occasions, the bank says it has always "believed in the potential of blockchain technology". "We are supportive of crypto-currencies as long as they are properly controlled and regulated," Umar Farooq, JP Morgan's head of Digital Treasury Services and Blockchain, wrote in an online Q&A page. For this reason, crypto-currencies are attractive to people who want to make illegal purchases on the Dark Web - a part of the internet that is not indexed by search engines. Once published, the information in a certain block can't be changed. If people try to tamper with that information, it becomes obvious. No. JPM Coin is not for retail customers - it will be used internally by JP Morgan to enable the instantaneous transfer of payments between institutional accounts. The client can then use the coins to perform transactions over the bank's blockchain network Quorum with other clients, for example money movement or payments in securities transactions. "It doesn't even need a blockchain at all because JP Morgan runs it. They could do it on a website and database they run," David Gerard, author of Attack of the 50 Foot Blockchain: Bitcoin, Blockchain, Ethereum & Smart Contracts, told the BBC. "It isn't like Bitcoin that aren't under anybody's control - it's a centrally controlled thing that sounds vaguely like crypto-currency." JP Morgan says that it is trialling crypto-currency and blockchain in order to speed up payment transfers, as well as reducing clients' counterparty and settlement risk, and decreasing capital requirements. JP Morgan's Umar Farooq told the BBC that JP Morgan is using blockchain because of the improvements in speeds and security that the technology offers. "There is a possibility in the future of a blockchain that is private, except from the regulator," said Mr Farooq. "There are various ways to make the regulatory regimes across the world stronger over time."